It should come as no surprise that Cher Horowitz, Alaïa-wearing queen bee of Beverly Hills, is one of my top film fashion icons. From her classic yellow plaid skirt suit to her fabulous takes on preppy schoolwear, the style of Clueless's heroine is just as influential now as it was in the 90s. For a trendy fall look, I felt inspired by this particular Cher Horowitz outfit. 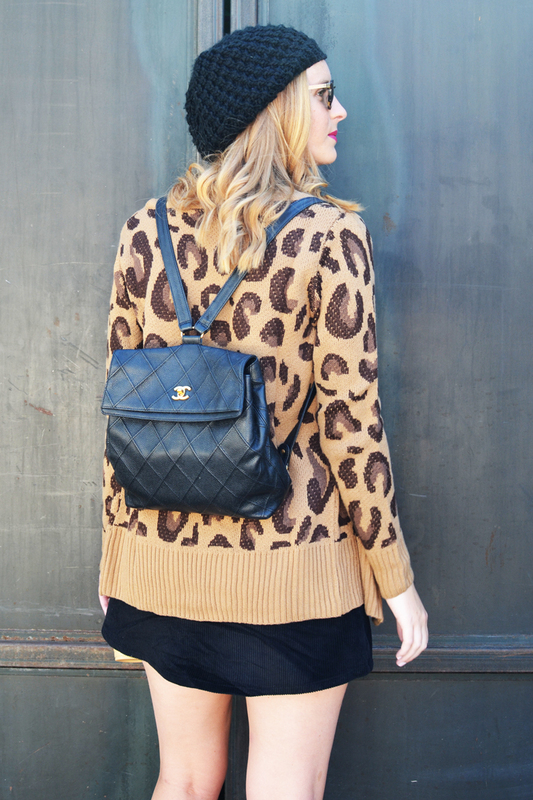 Berets are totally back for fall, so I threw a knit one atop my blonde head and paired with a sassy leopard print cardigan and super cute corduroy button-up dress, both from Tobi. You can't tell from the pictures because I had the back pinned, but the top of the dress is actually a halter top style, so you can show off a little bit of shoulder! I just love a dress with a fun detail like that. Check out the outfit, and scroll down to get all the clothing details! Photographed by my friend Bree!